When I met Tinto Figuero's chief winemaker Jean Francois Hebrand at a media dinner at Il Molino in New York recently, I had lots of questions about how a French winemaker fell in love with Tempranillo. Luckily, he was gracious and forthcoming about how he came to be making wine in Spain and conquering the challenges of Spain's most famous grape. Jean Francois, who was born in France's Bordeaux region and raised by a wine-making family, previously made wine in top Bordeaux chateaux as well as consulting in other parts of France and Switzerland. He moved to Spain and began making wine in 2001 and became chief winemaker at Tinto Figuero in DO Ribera del Duero in 2010. Here he makes elegant Ribera del Duero wines from 100 percent Tempranillo. As for the Tempranillo grape, Jean Francois characterizes it as "very generous." He explained that even though the grape skin is the same color as Pinot Noir, it produces a much more deeply colored wine. He added "Give it good conditions and it produces." The vineyard regions where Tinto Figuero's Tempranillo grows are calcacerous gravel, sandy, and clay. The influence of the Duero river is felt, as the river cuts through their property. Tinto Figuero uses organic farming techniques and relies on sponateous fermentation from natural yeast. For "personality and expression" Jean Francois says that "organic is best." He sources the wines from 80 different plots including 30 hectares of very old vines with 50 years plus age. Tinto Figuero 4 (Roble) 2016 - Four months in barrel is an indication that this wine is meant to be an easy-drinking, approachable wine - and it is. Bright fruit flavor of cherries shines through, and the wine has a nice acidic lift. American oak is used to give the wine round tannins. Crianza 12 2016 - Moving up in aging to twelve months, this wine provides a more structured approach to Tempranillo with deeper layers of flavor including red and black fruit. French oak is used on this wine to provide fresh tannins that Jean Francois says are good for aging. Tinto Figuero 15 (Reserva) 2015 - A gorgeous wine of depth and richness. Strong red and black fruit character and a very long finish. I rates this wine four stars. 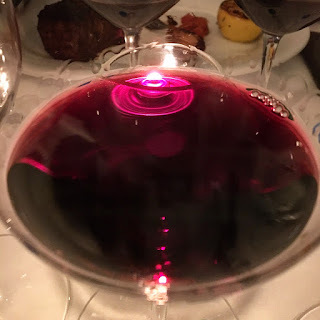 Tinto Figuero Vinas Viejas 2015 - Jean Francois says this wine is a "brother" to the 15. It has a more herbal nose, and the addition of minerality to the deep flavors and black and red fruit. The wine had huge length and ample acidity to sustain the richness. Milagros de Figuero 2014 - Named for a matriarch of the family, Milagros has a richly aromatic nose of violets and red currents. The grapes used are from bush vines with more than 60 years of age. They produced a wine very pronounced blackberry and dark cherry flavors with a hint of chocolate. Figuero Noble 2014 - The nose was a melange of violets, herbs, and raspberry. On the palate, blackberry jam and sour cherries as well as a hint of eucalyptus and spice. This highly-structured wine had tannins that were present but well-integrated. The finish had great length. Figuero Tinus 2012 - A rare wine from a single, family owned vineyard of 70+ year old vines. The nose promised black fruits and eucalyptus which carried through on the palate. There were complex layers of flavor including black plums, pomegranate, and baking spices including cloves. The huge finish lingers. I found this a wine of great complexity. This is an achievement of winemaking that indicates the beauty and age-worthy quality that these Ribera del Duero Tempranillos can achieve. 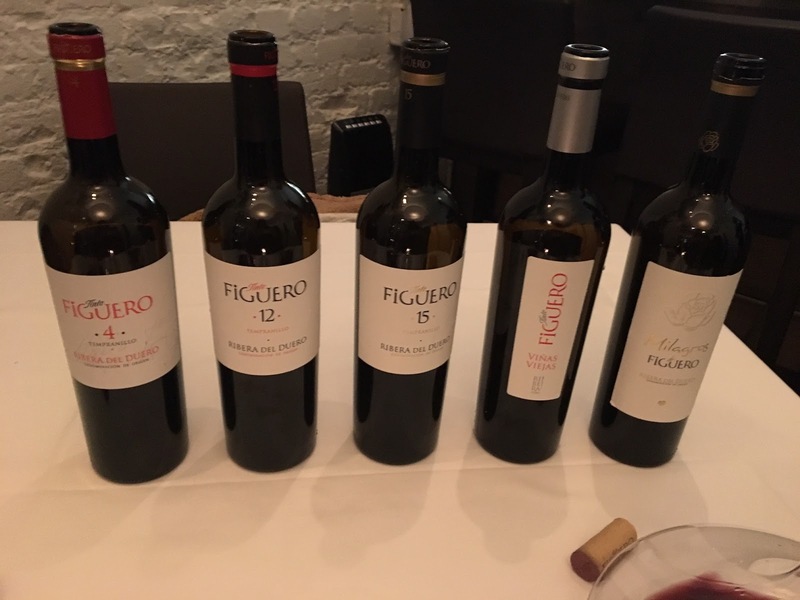 This tasting of Tinto Figuero with Jean Francois Hebrand revealed a well-composed portfolio of quality wines at a range of price points to satisfy consumers seeking expressive Tempranillo from the famous Ribera del Duero region. Simonsig winery, based in the Western Cape of South Africa, celebrated its 50th anniversary in 2018, and this year's releases prove that the winery's longevity is well deserved. 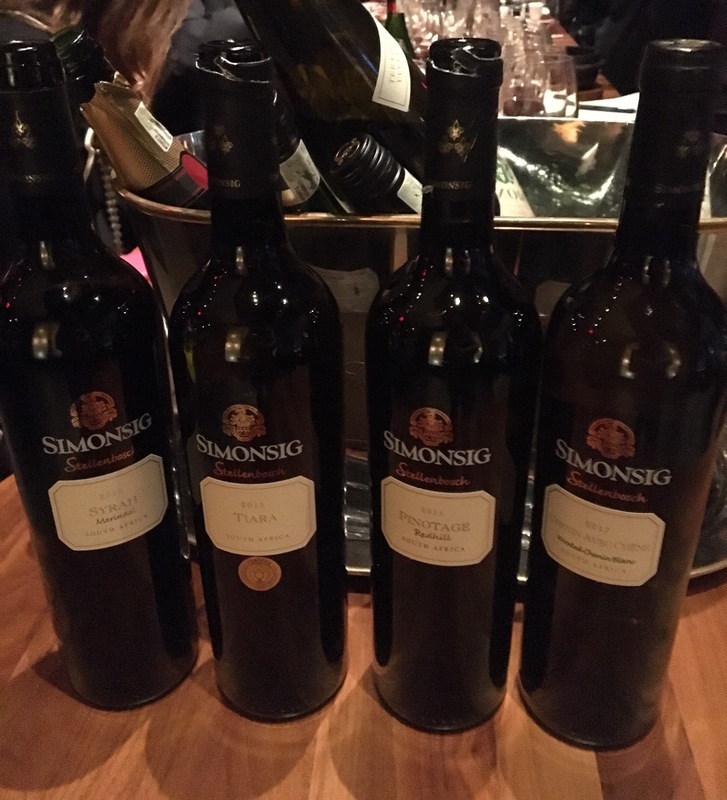 Simonsig Marketing and Sales Manager Jacques Jordaan was in New York recently to present the wines available in the U.S. at a media dinner at the Korean restaurant Gaonnuri. 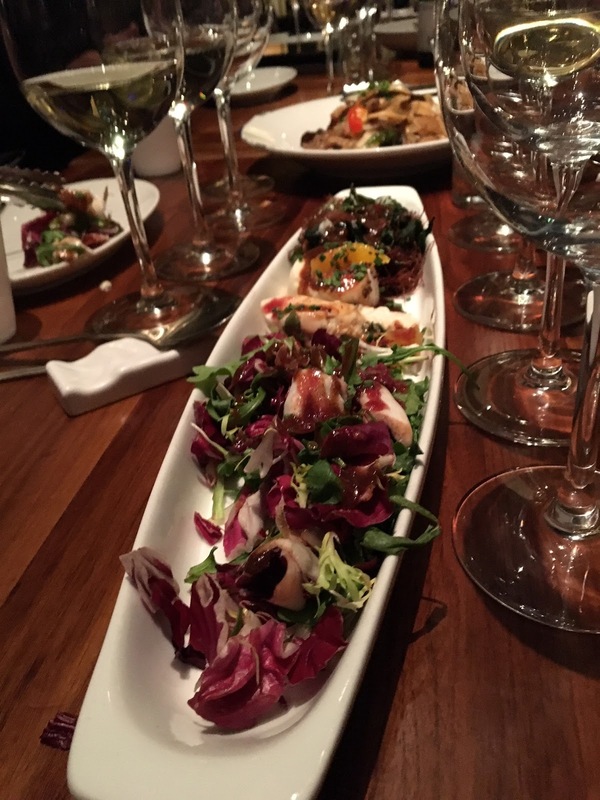 We enjoyed a range of highly seasoned appetizers - including salty, spicy, and sweet flavors - followed by short ribs and other red meat main courses - and the wines stood up well throughout. 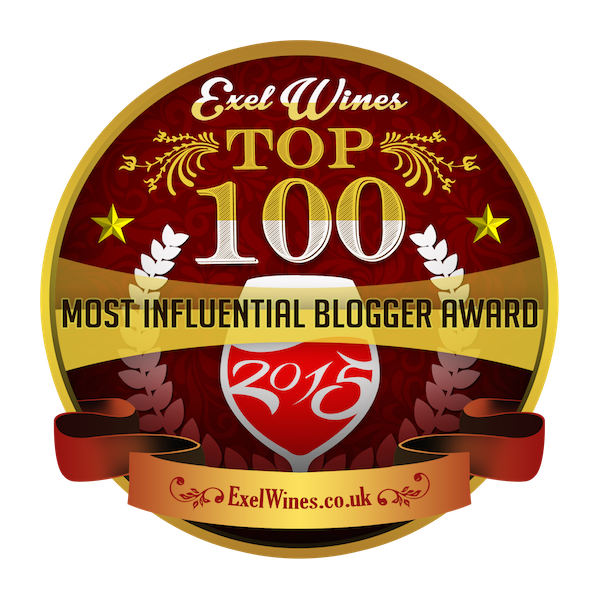 The dinner kicked off on a celebratory note with the winery's exellent Kaapse Vonkel Brut 2017. The name is Afrikaans for "Cape Sparkle." This medium weight sparkling wine made in the traditional method had toasty notes of brioche from 24 months lees aging as well as herbal notes of chamomile as well as white stone fruit. The sparkling wine was excellent with a baby greens salad with sashimi. It retails for $19.99, a great value sparkler. We progressed to scallion pancakes, and with these the Simonsig Chenin Blanc 2018 was a good match. This wine was a well-executed rendition South Africa's signature white grape, with crisp notes of lemon and riper notes of melon, followed by a hint of minerality, all balanced with a good amount of acidity. At $13.99 this is a fantastic white wine for everyday with lots of food pairing options. 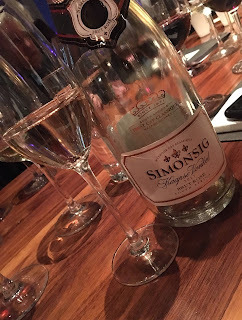 As we continued our feast, we tried the Simonsig Avec Chene Chenin Blanc 2017. This rendition of Chenin had more complexity, as the oak aging brought a different layer of structure to this wine that is sourced from the Estate's oldest Chenin vines, some dating to 1986. It is a wine that warrants more consideration, with layers of ripe pear followed by a bit of minerality and a touch of marzipan. It retails for $35.99. With the appearance of main courses - mostly beef and short-ribs - we welcomed the Simonsig red wines to the table. The Simonsig Pinotage 2016 exhibited bright cherry flavors and aromas and had a bit of spice on the back end with a medium long finish. This entry-level Pinotage shows the aromatic fruit nicely and is well priced at $17.99. Although I have tasted the wines of Simonsig on a number of occasions, I didn't recall having their Bordeaux blend, and I ended up being a huge fan. The Simonsig Tiara 2015 is a blend of 68% Cabernet Sauvignon, 24% Merlot, and the balance Cabernet Franc and Petite Verdot. I found the wine to be very elegant, with plush black fruits including plums, black cherries and blackberries, along with a hint of spice and a very long finish. I found this wine to be very drinkable at the moment but also worthy of aging - it retails for $38.99. Next came the Simonsig Merindol Syrah 2015, a 100% Syrah wine from Stellenbosch. This is a big red, with cherries and chocolate on the nose and palate. 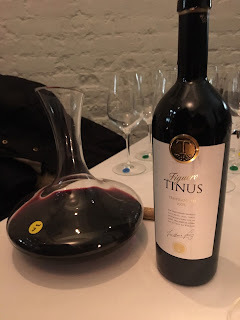 While it was a robust, big bodied red, I also found that it was balanced and had a nice amount of acidity to keep the wine from feeling heavy in the mouth. This was another wine I would drink immediately or age for 5-8 years. 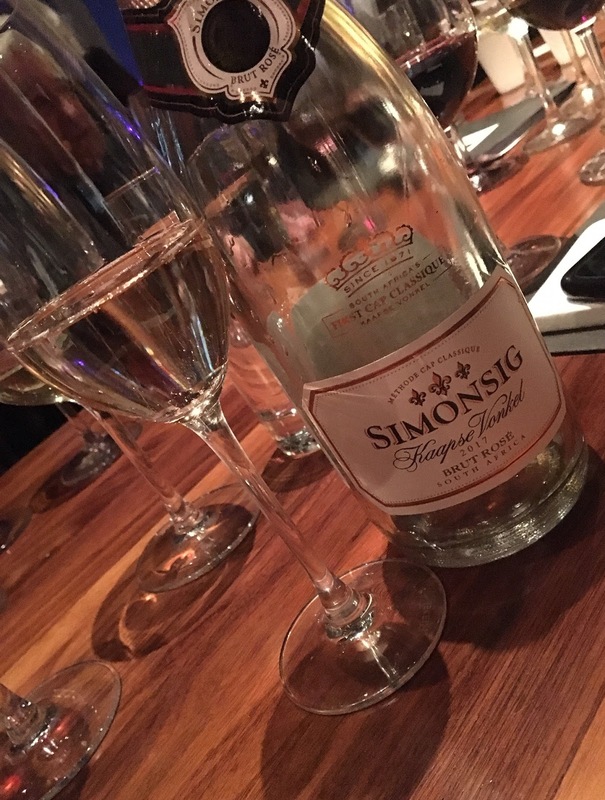 It sells for $43.99 in the U.S.
As tiny chocolate-filled madeleines made their way across the table along with other rich desserts, we ended dinner with another refreshing sparkling wine, the Simonsig Kaapse Vonkel Brut Rose 2017. I enjoyed its persistent effervescence as well as the flavors of strawberries and cloves. As much as Americans love their rose wines, I have a feeling this wine - comprised of 72% Pinot Noir, 27% Pinotage, and a dash of Pinot Meunier - will be popular, especially at the $24.99 price. The night had been a wonderful showcase for the strong quality and precise winemaking of Simonsig. These wines stood up to the many strong flavors of Korean food we enjoyed, and were also delicious on their own. The fact that even the most high-end bottles are less than $45 seems to ensure that Simonsig will continue to be a successful South African wine producer for at least another 50 years. Brazilians are known for fun - carnival parades, the beaches of Rio, dancing the Samba until all hours. 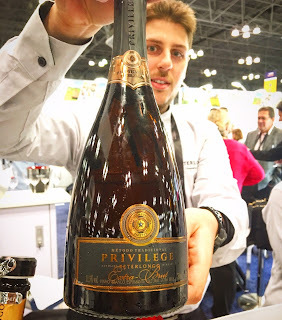 But winemakers in Brazil are getting serious about creating world-class sparkling wine, which, when you think about it, is always a fun beverage. Brazil is not a huge wine-drinking country, with a paltry 2 liters per person per year consumed there. Those Brazilians who do drink wine, like it on the sweet side. But today's young generation of winery owners and winemakers are looking to capture foreign markets with dryer wines suited to international tastes - and at the forefront of that effort is a push for sparkling wine. Brazil's pursuit of sparkling wine success encompasses all levels of production. The more economical charmat method creates value-driven wines that are fruit forward and fizzy - straightforward and easy drinking. But Brazil also makes sparkling wine with the "traditional method" used in Champagne and other prestigious regions, in which secondary fermentation occurs in the bottle. This produces wines with more toast or biscuit notes from the extended time on the lees, or dead yeast. Traditional method Brazilian wines are at a quality level that can compete with wines such as French cremants and California sparkling wines. The price point of around $18-$25 makes them an attractive alternative to sparkling wines that start at double that price. There are over 100 grapes grown in the huge country, with about an even split between white and red. There are no native grapes grown here, so you see international varieties such as Chardonnay and Merlot, as well as varieties that reflect the country's Portuguese roots as well as the Italian heritage of many of the people in southern state of Rio Grande do Sul, where some of the most successful wineries operate. Brazil is also aspiring to become a wine tourism destination. The rolling green hills of the Serra Gaucha wine region and elegant new winery hotels are sure to attract travelers ready for a new country to explore with a glass of bubbly always at the ready. 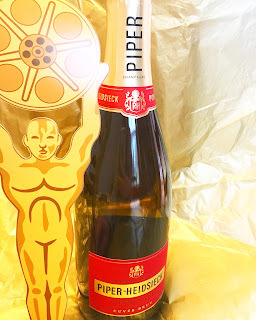 Piper-Heidsieck is the official Champagne of the Oscars, so when you tune in tonight you’ll know this is the bubbly that the stars themselves will be celebrating with. Why not pick up some bottles for your own Oscar-watching party to commemorate a great year of film? Whether you’re rooting for Rami Malek or Bradley Cooper, Glenn Close or Melissa McCarthy, you can drink like a Hollywood star. Nothing says elegance like Champagne, and Piper-Heidsieck has been a glamorous choice for centuries – Marie Antoinette loved to drink the cuvee in the eighteenth century. Over the years, Piper-Heidsieck was poured at royal courts across Europe and Asia. Adding elegance to your own Oscar watching – whether at a posh party or in your PJs – is as easy as popping a cork of Piper-Heidsick. Your choice of snacks runs the gamut, as Champagne pairs with nearly everything! But perhaps the best choice tonight is to drink Champagne with buttered popcorn. So start popping and pouring to get ready for Hollywood’s big night. The neon Valdivieso sign - a larger-than-life bottle of sparkling wine being poured into two flutes - is so beloved a fixture in Santiago that it was declared a national monument in 1954. The winery was the first sparkling wine producer in the Americas, having produced its popular bubbly since 1879. And while the historic winery still enjoys wide popularity for its sparkling wine, it is also exploring Chilean terroir to create a range of still wines for both domestic and export markets. I had the opportunity to meet Valdivieso winemaker Brett Jackson in New York recently at a media event. Brett began making wine in his native New Zealand, and -- in a career that has spanned decades -- he also has made wine in Napa, Stellenbosch, and Southwest France. Brett brought this world-wide experience with him when he joined the winery, and he's made great strides in strengthening its still wine program. We tasted through some of the winery's current releases of red wines, and I was impressed by their overall elegance and balance. Valdivieso Single Vineyard Cabernet Franc 2015, Curico Valley - A gorgeous, rich rendition of Cab Franc with ripe red berries and minerality. 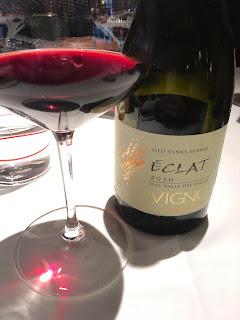 Eclat Cinsault 2017 - A delicate wine, with a translucent ruby color. This wine also had red berries on the palate and a crisp light weight. Brett told us it is dry farmed from vines on their own rootstock and fermented in stainless steel to preserve its freshness. 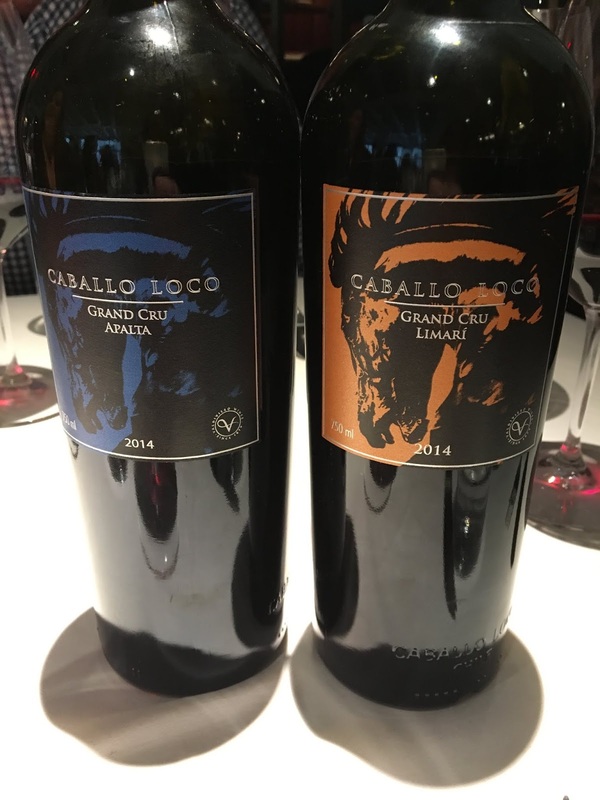 Caballo Loco Grand Cru Apalta 2014, Colchuagua Valley - Brett informed us that the "crazy horse" reference in the name was from one of the winery owners who was a larger than life character. He explained that the Caballo Loco wines are meant to reflect the "essence" of where they come from. This wine from Apalta is a blend of Cabernet Sauvignon and Carmenere. The rich, full-bodied wine has ripe red and black fruits and a mineral finish - a bold wine for steaks, chops, and hearty stews. Caballo Loco Grand Cru Limari 2014, Limari Valley - This wine showcases Syrah from the Limari Valley, where its proximity to the coast produces a cool influence but there is also plenty of sunshine. The vineyard soils contain calcium as well as salt. This was another big wine, with full mouthfeel, and it exhibited fully ripe black fruits, spice, good acidity, slight minerality and a long finish. Valdivieso Eclat Old Vines Blend Vigno 2010 - This project blends old vine Carignan and Mourvedre from the Maule Valley with at least 40 to 60 years of age. All of the grapes are from bush vines that are dry farmed. The resulting wine has a delightful freshness, with sweet bing cherry flavor -- and a high acidity that makes it ageworthy. The still red wines from Valdivieso that we tasted were high quality and well-balanced, and all sell at appealing price points between $25-$35. For lighter style reds, reach for the Cinsault or Cabernet Franc. And for a bold red pour, the Caballo Loco line delivers. Stumped about what wine to pair with cheering for the Super Bowl? With over 50 years of play, the game is as American as you can get, so why not pour an iconic American wine? Robert Mondavi was one of the pioneers of Napa Valley, founding his eponymous winery in 1966. Robert Mondavi wines created from the now-legendary To Kalon vineyard (the name means "highest beauty" in ancient Greek), are wonderfully expressive. This vineyard sources the winery's signature Fumé Blanc - the Sauvignon Blanc named with a nod for the Loire Valley's Pouilly Fume - as well as its superlative Cabernet Sauvignon. Looking for some delicious wine and food pairings for tonight's game? 2016 Robert Mondavi Reserve To Kalon Vineyard Fumé Blanc with oysters - The aromatic citrus notes of the Sauvignon Blanc along with its creamy mid-palate will match wonderfully with fresh oysters. 2017 Robert Mondavi Winery Pinot Noir Caneros with stuffed mushroom caps - this lighter-bodied red with notes of dark cherries and baking spices is a good weight to pair with this crowd-pleasing vegetarian appetizer. 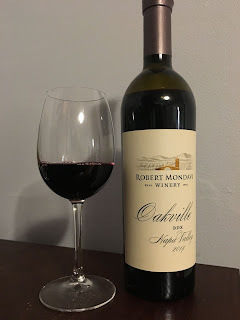 2014 Robert Mondavi Oakville BDX Napa Valley with pepper-bacon potato skins - This Bordeaux-blend of Cabernet Sauvignon from the To Kalon vineyard and Cabernet Franc make a plummy, lush red wine that's not shy on flavor and will deliciously pair with rich and smoky bacon on these classic game-time snacks. 2014 Robert Mondavi Reserve To Kalon Vineyard Cabernet Sauvignon Oakville Napa Valley with grilled steak nachos. Gorgeous layers of dark fruit are expressed in this lush wine, which will beautifully complement the seared steak of this shareable dish. Beaujolais Nouveau had a great vintage in 2018, according to Franck Duboeuf, so it's time to give these wines a taste beyond the Thanksgiving holiday. 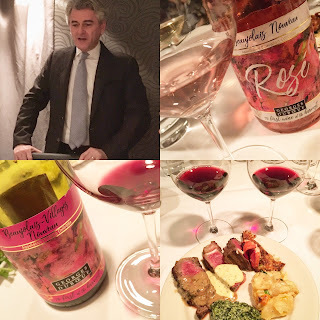 Franck was in New York to introduce this year's line of new wines from the winery founded by his father, Georges. The Georges Duboeuf wines from the new harvest include Beaujolais Nouveau and Beajolais Village Nouveau - which is made from grapes grown in villages designated for the quality Gamay grapes. And now the line includes Beaujolais Nouveau Rosé. Ringing in the new year, make a resolution to broaden your palate with the lighter-style wines of Beaujolais Nouveau. They are perfect aperitif wines to welcome guests with as they arrive and to enjoy with lighter flavored meals. I attended a media event with Franck Duboeuf at Morton's Steakhouse. We got to taste through the 2018 Beaujolais Nouveau lineup as well as some more mature Beaujolais from the Cru Villages. Georges Duboeuf Beaujolais Nouveau 2018 - Fresh and fruity wine, smooth red fruits, bright and fun. Georges Duboeuf Beaujolais-Village Nouveau 2018 - A more sophisticated rendition of the fresh Nouveau style, this wine had intense aroma and palate of crushed blackberries and raspberries. Georges Duboeuf Beaujolais Nouveau Rosé 2018 - Produced from hand-harvested grapes, Franck informed us that this wine was made as a "true rosé," meaning that it is made by brief skin contact on the juice. I found it light bodied with pretty strawberry and raspberry flavors - an engaging wine for the rosé lovers in your crowd. We also tried several other offerings from Les Vins Georges Duboeuf. Pouilly-Fuissé 2016 - From the Macon region, this wine had a fresh citrus aroma and clean, bright flavors of lemon and minerality, with a good finish. Jean Ernest Descombes Cote du Py 2017 - From 50 year old, south facing vines, this wine had a fresh red fruit nose and rich flavors of ripe bing cherries as well as minerality on the palate. A delicious wine that shows depth of flavor and a good finish. Chateau des Capitans Julienas 2017 - Fresh aromas of black cherry and white pepper, the wine offers raspberries and cherries on the palate with a hint of tannin. This wine is made from grapes grown in the heart of the AOC Cru Julienas region. So, whether a light-bodied Beaujolais Nouveau or a more structured Cru Beaujolais, the wines of Georges Duboeuf offer a way to bring new flavors to your glass in 2019.